Strawberries and Buttercups: oh my! Yikes! I know. I couldn't cope with it being like this so yesterday morning I got up and put all the clothes in the washing machine. Dumped everything on the bed so it looked quite similar to my desk and got sorting it out... that it eventually looked like this. 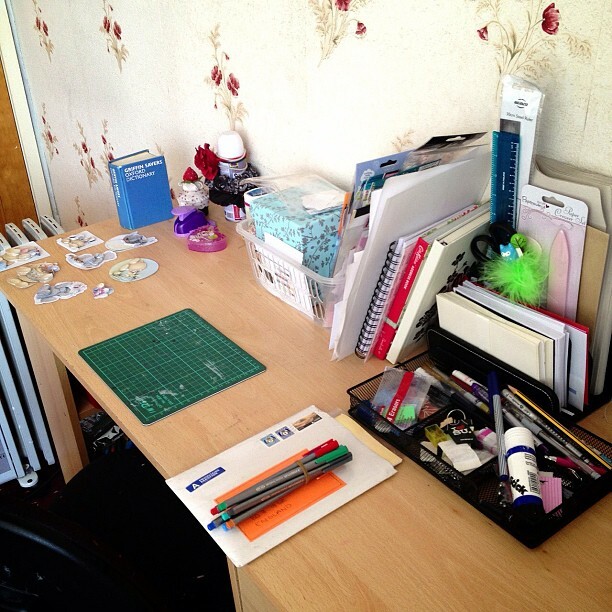 My desk was always as tidy as this so I need to get back into that routine again. 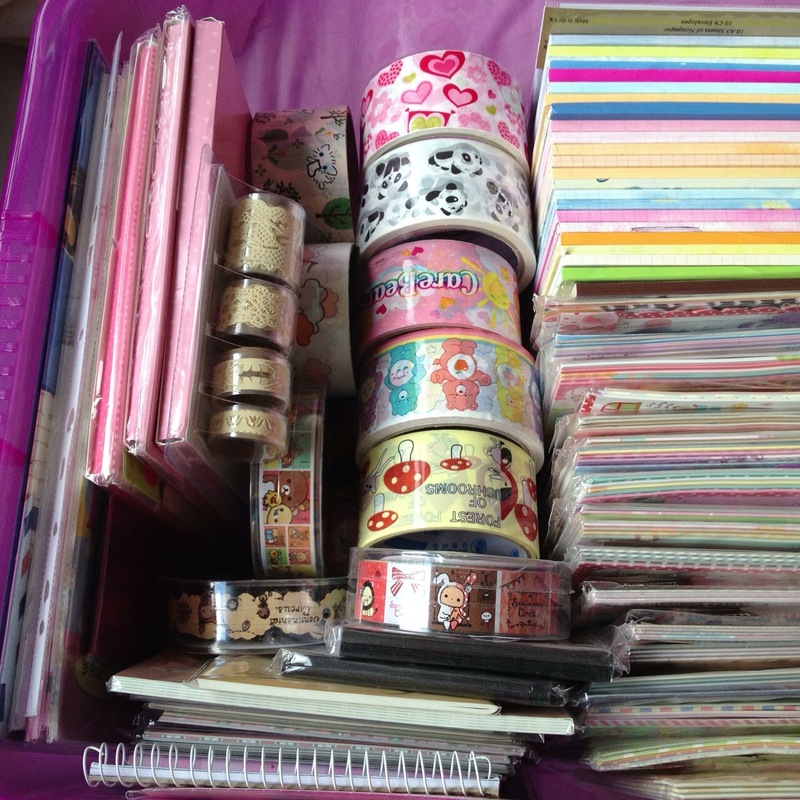 I only have my stickers, pens, envelopes, a letter I've made a start on and some decoupages for cards I need to make as well as some other bits. At least my desk can breath now. I usually have a plain sheet of paper on my cutting mat as whilst I write letters I tend to doodle a bit too. I also organised all my tapes and as someone asked to see them I took a photo of all my tapes. 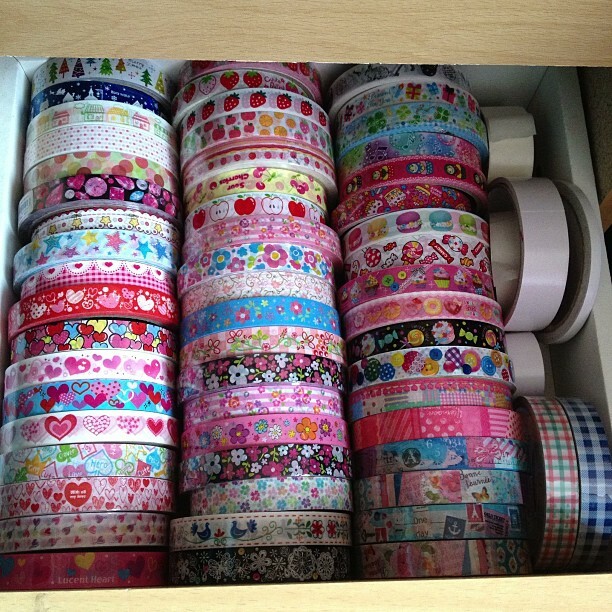 I put all my washi, paper and fabric tapes in to this box which I received my yozocraft order in. The diddl are the smallest tapes that I have. I only had one draw full before my last purchase from angoo-mart but now I have 2. 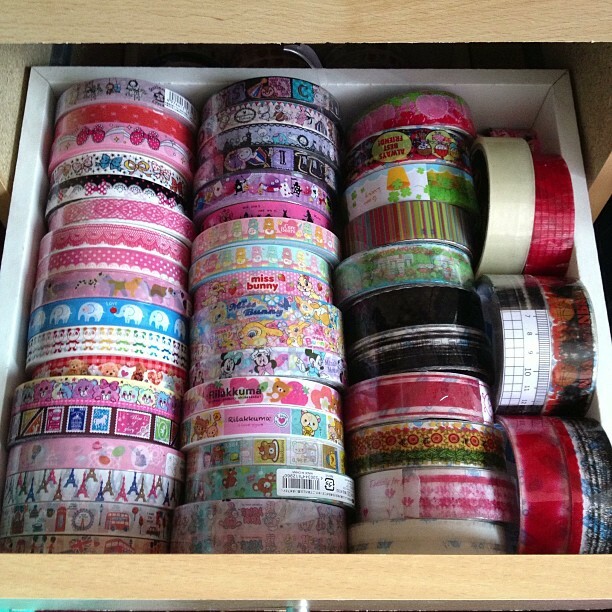 I decided to organise the tapes in to themes... hearts, stars etc... because that is how I tend to choose my tapes when decorating my letters and envelopes anyway so its best to have them all together so that I can see exactly what I have. I have got 2 of some tapes and most of these are still closed so some of them may end up as gifts or in giveaways. Also quite a few of them are almost finished especially the transparent ones as they don't have much on them but they were from my very first order 4 years ago and I don't like the designs all that much which is probably why I still have them. I will try and use them more often though so that I can clear some space. 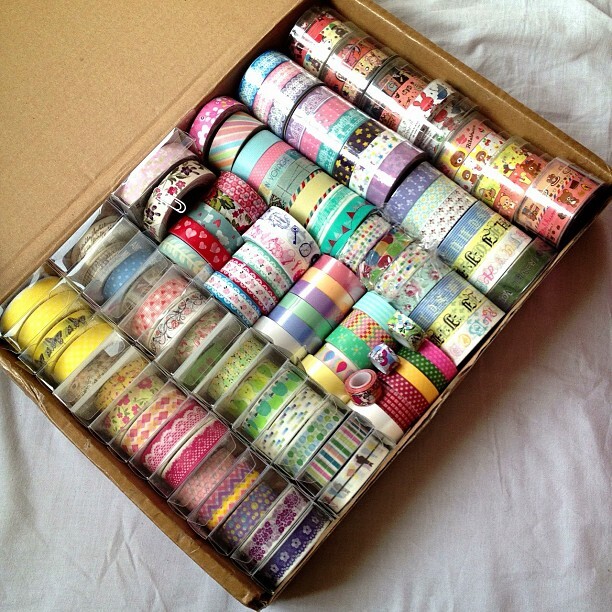 I have put some of my tapes with my letter sets also and that was already organised as I think it was in December my younger brother and I went to the local store and bought lots of boxes as my previous boxes had no lids so all the dust was collecting in them. I have one for envelopes, craft supplies, letters, rubber stamps but need to get one more for my craft paper. 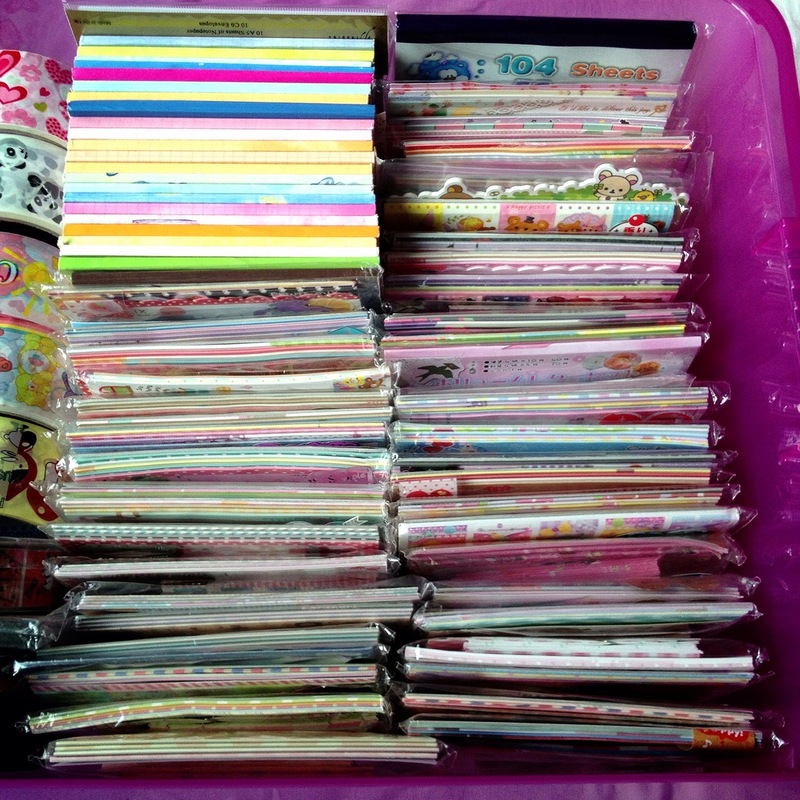 Here is what my letter set/pad and now my big rolls of deco tape are kept. 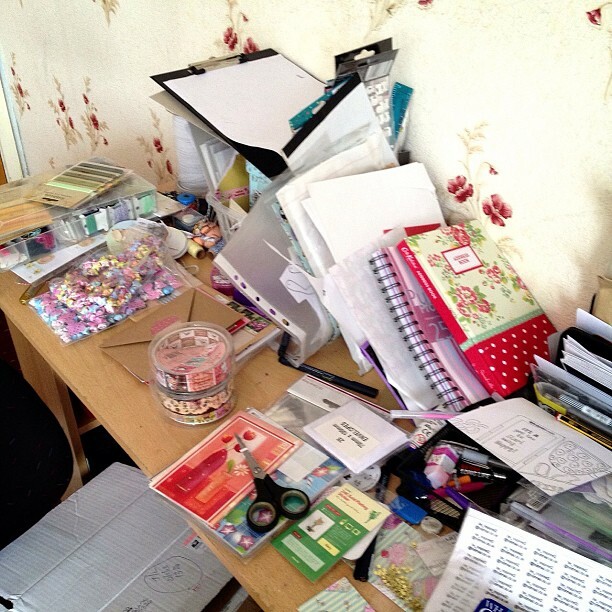 Do you always have a tidy desk and are you organised? I mean awesome, it feels so much better after you have cleaned out and up isn't it? Oh! I'll hand over everything just don't tie me up! It does feel great to have things in order now. I really like to keep my desk tidy and everything organized. It is easier to find things that way. I always tidy things up before I leave my desk but lately it was not happening so it really needed to be done and hopefully it will stay like that. It's so neat to see photos of people's letter writing stuff. 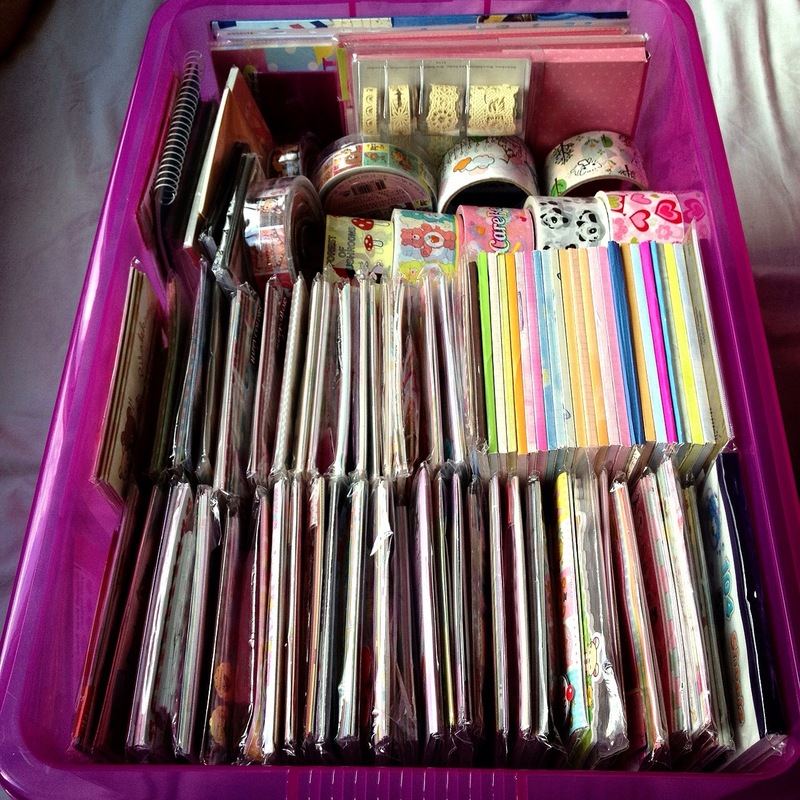 Then I don't feel as bad about the amount I have :) I should attempt to get a photo of my area-it's a spare bedroom, so I actually write most of my letters on my really old bed with a lap desk-probably not the best for my body, but...ah well! Its true it doesn't make you feel bad but I don't feel I have all that many letter sets as that is only half a box and then majority of it is gifts as I only made that order from Janet stores lately and that was maybe a quarter of it. The Diddl of course I bought it and that will last a life time :). I hope that you do get an order from angoo-mart as its worth it. My first order I bought a lot as complete sets as they worked out so cheap compared to individual ones, they have sales etc... on and the postage I find reasonable as they have quite a lot of options.